long past the time of the superhero/sidekick dynamic that Congo Bill hooked up with Janu the Jungle Boy, and Tomahawk met Dan Hunter. Kid Flash was, in some ways at least, a continuation of that trend. The familiar mentor/protegé relationship wasn't exact, as he didn't become The Flash's constant companion from the moment of introduction, but clearly, DC hadn't quite gotten over the idea that every hero can use a sidekick. 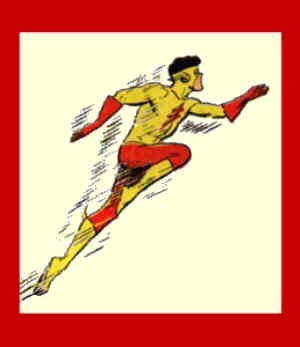 The character was introduced in The Flash #110 (January, 1960), in a story written and drawn by the comic's regular creative team, John Broome (Captain Comet, Elongated Man) and Carmine Infantino (Phantom Stranger, Dial H for Hero), respectively. Wally West, nephew of Barry "The Flash" Allen's girlfriend, Iris West, was visiting from the nearby small town of Blue Valley; and Barry was showing the boy around the police forensic lab where he worked. As luck would have it, a lightning bolt crashed through the window, dousing Wally with chemicals in an exact duplicate of the accident that had given Barry his super speed; and sure enough, Wally got the super power too. Barry gave him a duplicate of his Flash outfit, and Kid Flash's superhero career was off and running. Even in comic books — what're the odds? At first, Kid Flash appeared every other issue, usually in an adventure of his own back in Blue Valley, but sometimes teamed up with the "senior" Flash. Later, his appearances became more sporadic. In #135 (March, 1963) he got a new costume, to make it easier for readers to tell Barry and Wally apart when they were together. But the two continued to have mostly separate superhero adventures; and the younger one's appearances became steadily less frequent. In The Brave & the Bold #54 (July, 1964), Kid Flash teamed up with a couple of other costumed sidekicks, Batman's Robin and Aquaman's Aqualad. Six issues (one year) later, they repeated the performance, adding Wonder Girl (whose relationship with Wonder Woman is less easy to articulate than hero/sidekick) and calling the group The Teen Titans. A few months later, they appeared in an issue of Showcase, and from there they went into their own title. The first issue was dated February, 1966. Kid Flash stayed with the Titans as long as the group lasted (that is, until 1973), and was back when it was briefly revived later in the decade. In 1980, he became a charter member of The New Teen Titans, a completely reconstituted version of the team. Again, he stayed with it a good while, but by the time his association with this one was done, he was no longer Kid Flash. In the mid-1980s, DC elected to retire (i.e., kill off) The Flash, and start over with a new one who looks and speeds just like him. In Crisis on Infinite Earths #12 (March, 1986), Kid Flash responded to the death of Uncle Barry (who had married Iris by then) by dropping the first part of his superhero name, switching back to a costume just like Barry's, and carrying on Barry's superhero work by being just like him. And that was the end of Kid Flash qua Kid Flash. There's a new Kid Flash now — a new super-speedster called Impulse, whose relationship with the new Flash was already analogous to this Kid Flash's with his own mentor, eventually assumed that name. At DC, no trademark is left behind. Text ©2005-10 Donald D. Markstein. Art © DC Comics.